Technology is advancing day by day and there is numerous genius found around the world like me 🙂 who develop new things for fixing human hurdles. Long gone are the days when you had to type out all the content of an image file just to edit it. 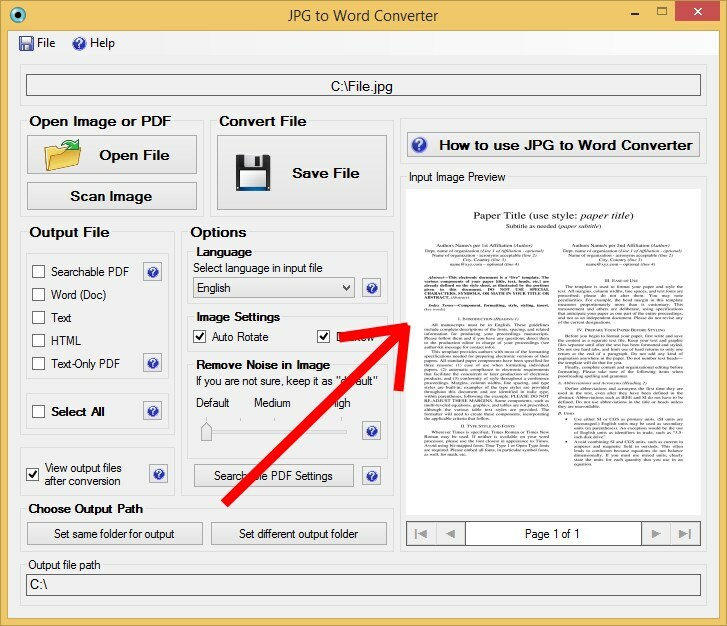 Today, you can just convert jpg to word file directly by using OCR softwares or tools. 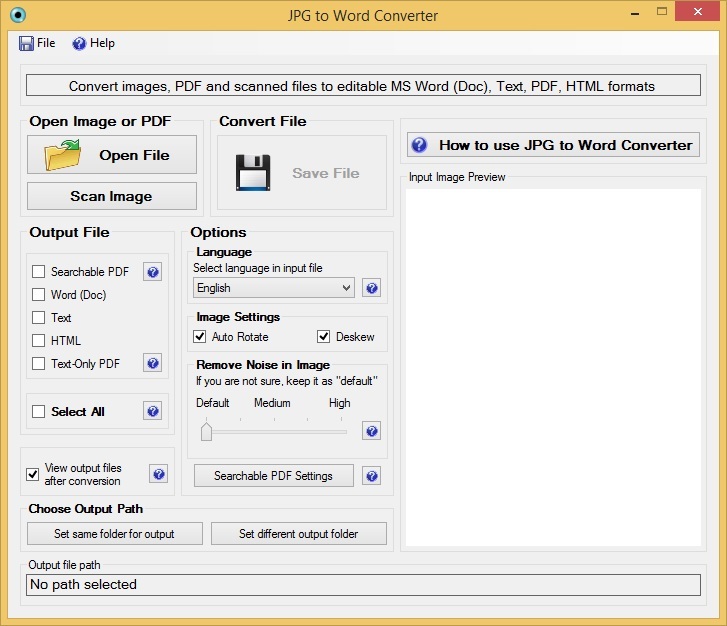 There are many free JPG to Word Converter softwares or Free OCR software available on the web which you can easily download and use them for converting jpg to word file format for your required image files. Before discussing “how to convert jpg to word file format” I would like to explain what is OCR software and how it work? What is OCR Software and How it Works? OCR stand for Optical Character Recognition is a technology in which the characters in the input image file are scanned and then compared with the stored character. If a match is found then the character is accepted. This technology relies heavily on the input image quality. If the quality of the input image is high, then the output will resemble the input to a large extent. On the contrary if the input image quality is low, the output will not be proper. This is because OCR cannot recognize broken or hazy characters. There is another way in which OCR works. Each letter has a unique feature and strokes. For example, the letter A has 3 strokes; they are ” / \ and – “. Similarly, B has different features and different strokes. What OCR does is that it compares the strokes and features of the input image with that of the stored character’s strokes and features. This method is widely used and results in much better accuracy and precision. The technology cannot work by its own. There are specific softwares; called OCR Tools that harness the power of OCR and give you the converted output. How to Convert JPG to Word File Format? There are two major ways of converting JPG to Word format. I will go through both methods. Go to onlineocr.net, using the “select file” option, select the image file you wish to convert and upload it. Select the language in which the text of the scanned file is written. Then you will be required to enter a captcha. Do it and click on the convert button. Your conversion should be completed. Then download the converted .docx file. This method has a lot of pros and cons. The major advantage is that there is no need to download a software and you can instantly convert any file. But the major flaw with this tool is that if you do not have an active internet connection, the file cannot be converted. So, it means you should have an internet connection to take benefits of online OCR tools. Another way of converting the JPG to Word Files is by using a downloaded OCR Software. There are a lot of free and best OCR software in the market using OCR technology and all of them are equally good. But to reduce confusion for our readers, I selected one of the best OCR software, namely, JPG to Word Converter. First, you need an OCR software to convert your files from the image to word format. I will use JPG to Word Converter for this purposes. Download the software from here. You can also use this link JPG to Word Converter. After scanning, you will have to select the output format. Since we want a Word file, check Word. After following all the above steps, just click on the SAVE icon to get your file in the desired output format. TA-DA! You just converted a JPG File to a Word File. It’s easy, right? If you need further clarification please refer to this video. As mentioned at the beginning of the article, the quality of the input image decides the quality of the output file. So always try to have a good quality input image. Password Protection: The software offers password protection for the output files to prevent any unauthorized access to the files. Watermark: The software has a feature to add a watermark to the output file to prevent illegal distribution of your output file. That’s just about it. If you followed the above steps properly then you should have converted JPG File to Word File. After reading this article, you can convert JPG to Word file format without facing any problem but if you are, then don’t worry and feel free to text in the comments section. Do let me know which one OCR method you are currently using for converting your jpg files into word format; Online OCR Tools or OCR Software?